hello guys, I hope you are doing well. After getting some pain in the last 4-5 weeks, this week bring some relief for option writers like us. Most of the time Market consolidate in a range only. As we saw a good rally with high momentum, It seems the market is taking some halt to continuing again it’s upside journey. RBI cut 25 basis point in its monetary policy meet this week, that means loans will be cheaper, Which is good for Auto and Infra sectors. 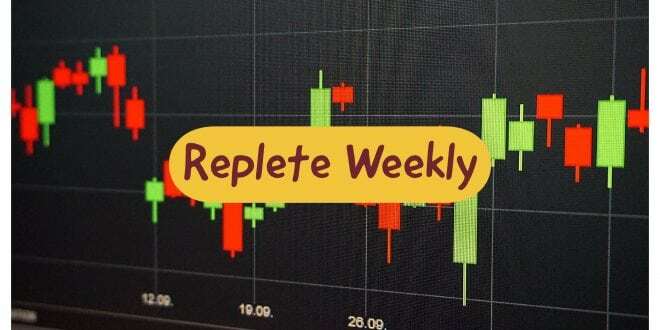 We saw some good buying in Midcap & small cap stocks from the last couple of week. As I already told in my previous report that it’s a good time to start some buying in fundamentally strong stocks fro your medium to long term portfolio. Most of the good stocks either already gave breakout or ready to give. So keep Tracking. Remeber one thing, Money will only come to you if you have an ability to take the right decision at the right time. So take a wise decision. If you are facing any difficulty, ask us we are happy to help in every possible way. This entire week Nifty traded in a range of 200 points only. 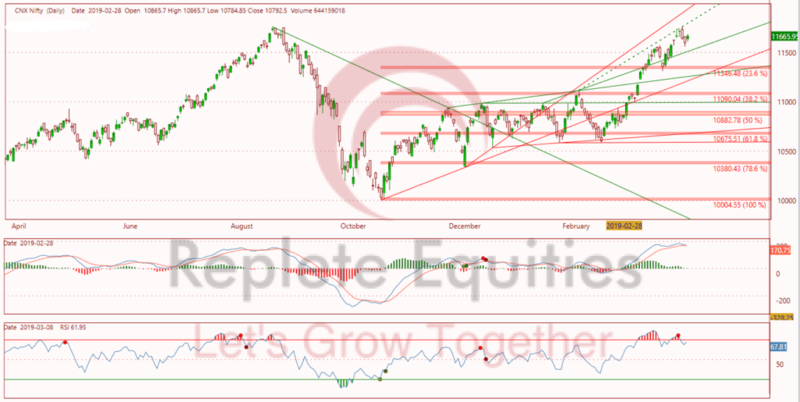 As we discussed in our previous post, 10760 is a good resistance which needs to break for Its continuos upside journey. Now Momentum indicator MACD is giving a signal of weakness in Momentum and RSI is giving a negative divergence which is indicating some weakness in NIFTY. Now 11500 & than 11300 will act as strong support zones. Below 11500 we can initiate a short trade for a small target of 11300. Remeber one thing, Overall trend is Positive, so don’t expect much below levels until nifty is holding 11300. Based on weekly option chain data, Highest Open Interest stands at 11700 CE & 11600 PE followed by 12000 CE & 11500 PE. PCR of all strikes stands at 1.19 which is a neutral zone. PCR at 11700 stands at 0.50 which is acting a resistance zone and PCR at 11600 stands at 5.05 which is acting a strong support zone. 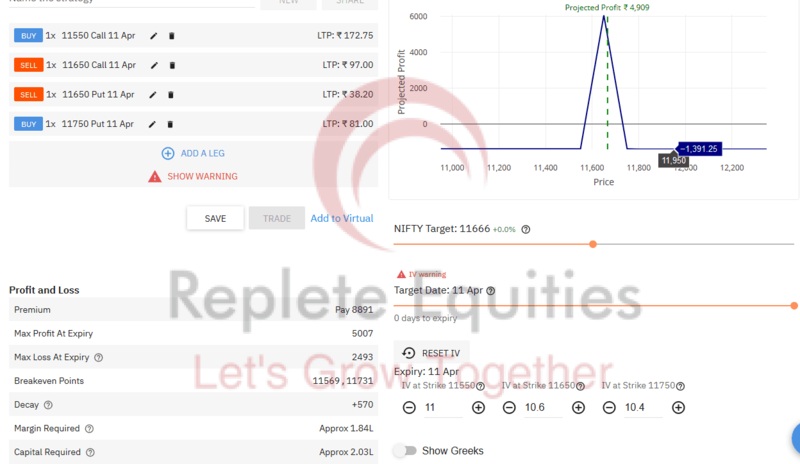 Option Pain an equally Important indicator stands at 11650 which is indicating expiry at 11650, Shift in option pain level will give further direction in trend and expiry level for the coming week. Book your profit whenever you are getting a 2000-3000₹ return. After getting a breakout at 27740, We saw a sharp upside movement in BankNifty. PSU Banks plays a major role in this rally. If we are looking at Fibonacci projection levels. 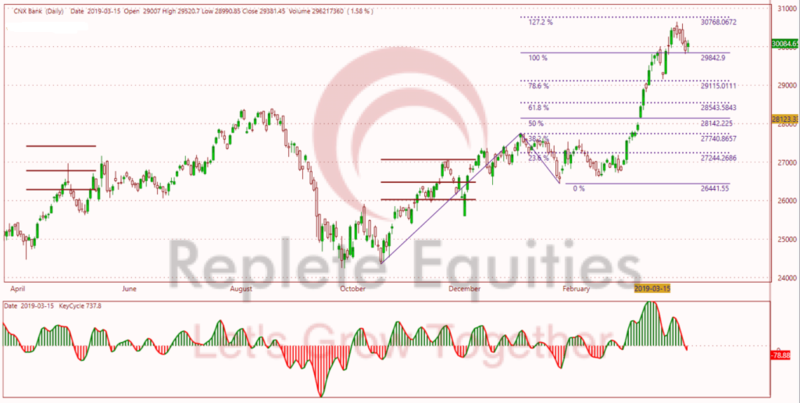 29840 is 100% projection level, Which becomes a strong support level after a breakout at the level. This week we saw some range boubnd activity in BankNifty. Friday Candle is an Inside bar candle, Monday candle will decide further move in BankNifty. If BankNifty manages to close below 29840 then we can expect 29115 will be our next support level. Thosw who are holding a long position keep a stroploss below 29840 and book profit if trailing stoploss hit. 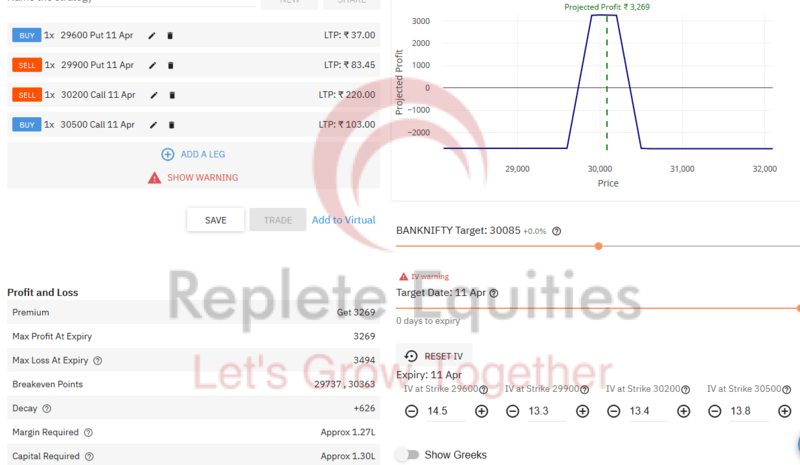 In the last couple of weeks, we saw some good upside movement in BankNifty so we can’t neglect the possibility of profit book which will drag banknifty to a lower level. On daily Chart, RSI is giving a negative divergence, which indicates a small weakness in trend and momentum. Over all Trend is UP and there is no clear indication of a change in Trend. Based on Weekly Option Chain Data, highest open Interest stands at 30500 CE & 30000 PE followed by 31000 CE & 29800 PE. PCR of all strokes stands at 0.91, which is a neutral zone. PCR at 30300 CE stands at 0.2, which is acting as a short term resistance level. On the lower side, PCR at 30000 Stands at 2.41, which is acting a short term support level. Option pain Stands at 30100 level, which is expecting Expiry level. a shift in Option pain will decide further move. 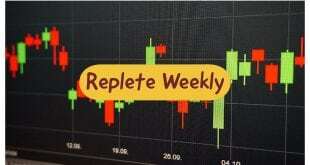 So this week Trading range is 29800-30300 based on current data available. Posible Adjustments: Breakout at 30363, Shift Put spread to a Higher level at Short 30200 PE and 29900 PE long. Same as a breakdown at 29737, Shift Call Spread, Short 29900 CE short and 30200 CE Long. book profit whenever you are getting 1-1.5% return.